Complementary to my German courses, for my students and all the others keen to learn German, there are in these pages a choice of test for all levels. If you have any question or comment at the end of the test feel free to leave a comment. If you think you need a refresh of your German memory and want to dedicate some time to take a course contact me, I’m a teacher for private lessons of German in Munich. 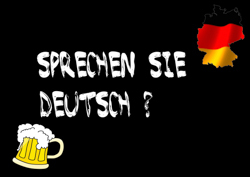 Listen the dialog between the Italian Alberto and the German Beate, then answer the questions. Answers and transcription of the dialog are below. B: Ich habe gedacht, dass ich in die Karibik fahre. Dann sehen ich endlich einmal etwas Neues. Und du? A: Karibik – sehr schön! Ich fahre dieses Jahr leider nicht weg. A: Ja, ich weiß… aber dieses Jahr möchte ich lieber in Deutschland bleiben. Dann kann ich mich richtig erholen, und spare dazu noch richtig Geld.